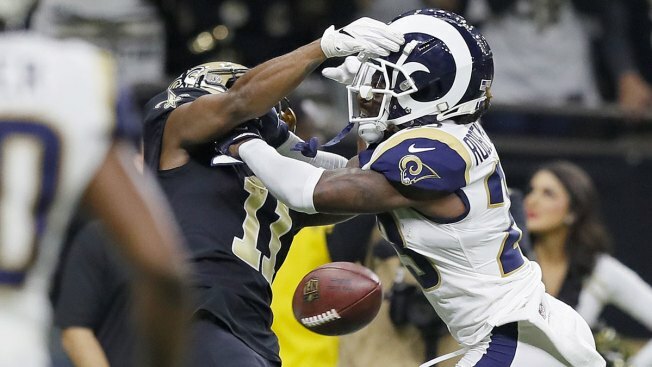 New Orleans Saints wide receiver Tommylee Lewis is takcled by Los Angeles Rams cornerback Nickell Robey-Coleman during the fourth quarter in the NFC championship game at the Mercedes-Benz Superdome in New Orleans on Sunday, Jan. 20, 2019. Saints fans chose to celebrate all day Sunday with an only-in-New Orleans spirit rather than watch the game. The party was the latest reaction to the infamous no-call late in the NFC championship game between the LA Rams and the Saints that prevented New Orleans from making it to Super Bowl LIII. The cover of the newspaper’s sports section also mocked the LA Rams for not scoring a touchdown in the Super Bowl. In true New Orleans fashion, a No-Call Second Line & Jazz Funeral took place on Super Bowl Sunday with thousands of Saints fans crowding the French Quarter decked out in Black and Gold and waving yellow flags. The display of festive anger included cheers of “We Got Robbed!” with a jazzy backbeat, Michael DeMocker, a staff photographer for The Times-Picayune, reported. Nielsen ratings showed just more than a quarter of TV-equipped households in the metro region watched the game, compared to 50 percent last year, the Times-Picayune reported.